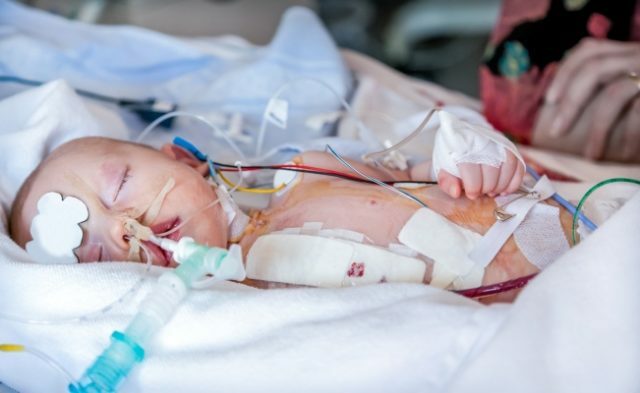 HealthDay News — Genetic heart diseases (GHDs) cause fewer cases of sudden infant death syndrome (SIDS) than previously thought, according to a study published in the Journal of the American College of Cardiology. David J. Tester, from the Mayo Clinic in Rochester, Minnesota, and colleagues conducted whole exome sequencing and targeted analysis of 90 GHD-susceptibility genes in a cohort of 419 unrelated SIDS cases (257 male; average age, 2.7 months). The researchers found that 53 SIDS cases (12.6%) had at least one “potentially informative” GHD-associated variant. For mixed-European ancestry cases, the yield was 14.9% (21 of 141), and for European ancestry SIDS cases it was 11.5% (32 of 278). A potentially informative GHD-associated variant was more likely in infants older than 4 months. When combining all 4 major cardiac channelopathy genes (KCNQ1, KCNH2, SCN5A, and RYR2), ultra-rare, nonsynonymous variants were significantly overrepresented in European SIDS cases vs European control subjects (P =.013). Only 4.3% of SIDS cases hosted a “pathogenic” or “likely pathogenic” variant, as defined by guidelines from the American College of Medical Genetics. Disclosures: Several authors disclosed financial ties to the pharmaceutical and medical device industries. Tester DJ, Wong LCH, Chanana P, et al. Cardiac genetic predisposition in sudden infant death syndrome. J Am Coll Cardiol. 2018;71(11):1217-1227.